TigerSwan’s Global Security Operations Center (GSOC) is at the heart of our worldwide missions. With operations continuing 24/7/365, GuardianAngel’s unblinking eye never rests. The GSOC realizes TigerSwan’s ability to maintain persistent monitoring of global political, civil, and meteorological events, ongoing missions, and other threat environments. 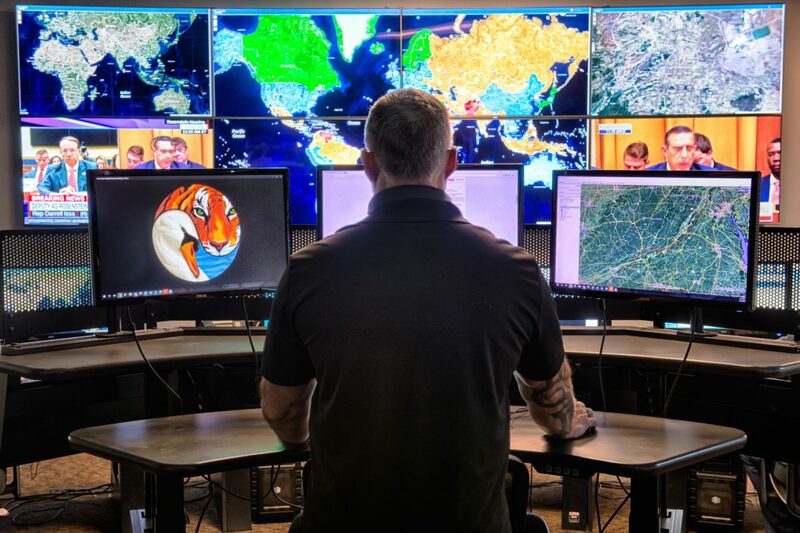 TigerSwan’s Global Security Operations Center was conceived and architected based on years of experience in global combat leadership, law enforcement, military intelligence, and asymmetric threat mitigation. The GSOC actively analyzes real time data generated from our GuardianAngel technology at the most granular level to anticipate and mitigate risk, and resolve crises as it unfolds anywhere in the world. Our GuardianAngel visual analytics platform works continuously to connect known and emerging sources of information – enabling organizations to recognize hidden patterns, detect anomalies, and forecast future conditions to identify, assess and resolve risk on a local, national, or global scale. GSOC maintains three physical locations around the globe, while lightweight, mobile operations centers can be set up within minutes. This built in redundancy ensures that GSOC is always capable of generating a common operating picture for any global mission, 24/7. The GSOC accelerates the aggregation of data globally to deliver actionable insights to interpret the connections between seemingly unconnected events. Delivering real time situational awareness and geospatial intelligence in the context of global events as they happen, we enable our greater TigerSwan team to rapidly pinpoint and resolve risk with data driven accuracy. Direct line of emergency communication to our crisis management experts, 24/7. TigerSwan is a registered Public Safety Answering Point (PSAP) licensee with access to NENA 911 Registry. Additionally, TigerSwan maintains call-and-response capability in nearly 50 countries worldwide. Pre-Travel Planning — analysis and report based on your travel itinerary, designed to ensure your safety while abroad and provide a customized assessment outlining risks and recommendations. Integration of your itinerary with our GuardianAngel platform. Emergency Push Notifications — users of the GuardianAngel smartphone app stay informed about acts of terrorism, crimes, civil unrest, natural disasters, and weather with our mass notifications feature. Data Loss Prevention and Recovery — in the event that your laptop or hard drive are stolen, GSOC protects your intellectual property and proprietary software by delivering an encryption code to your device, making it impossible to access its contents without the decryption code. GuardianAngel services are 100% confidential. GSOC staff are intelligence professionals tasked with ensuring your safety. Rather than tracking people, our GSOC persistently monitors issues. We deliver peace of mind by ensuring that you are not subjected to risk, only escalating an issue when your safety is in danger. The next time you leave home for business abroad or an international vacation, make sure to bring TigerSwan’s GSOC with you. By downloading our GuardianAngel mobile app, you are travelling with an instant connection to all of our GSOC’s capabilities and securing your peace of mind.